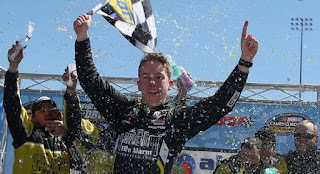 In a race delayed for two days by a freak snowstorm in southern Virginia, John Hunter Nemechek charged to the front on a restart with 31 laps left on Monday and held off Kyle Benjamin to win the Alpha Energy Solutions 250 NASCAR Camping World Truck Series race by a mere .106 seconds. The victory was the first at Martinsville for Nemechek, who had two previous runner-up finishes at the .526-mile short track. This time, despite Benjamin pounding his rear bumper in the final corner, Nemechek earned the grandfather clock trophy that goes to the race winner. Nemechek picked up his sixth career win in the Truck Series in his third start of the season, and he did it with a skeleton staff at the race shop owned by his father, Joe Nemechek. After Nemechek grabbed the top spot on Lap 220 of 250, he held it through three subsequent cautions. Nemechek cleared Benjamin after the final restart on Lap 244, and though Benjamin closed on the No. 8 Chevrolet over the last seven laps, finally getting to the bumper in the final corner, he needed a few more laps to make a concerted run at the victory. Benjamin had a lead of more than one second over Todd Gilliland when a debris caution slowed the race on Lap 214 and gave Nemechek the chance he needed on the subsequent restart. The shuffling of the order, at least, alleviated one case of divided loyalties. David Gilliland was co-owner of the No. 54 Toyota Benjamin was driving, and his son Todd was behind the wheel of the No. 4 Toyota of Kyle Busch Motorsports. After the restart on Lap 220, Todd Gilliland brushed the wall and lost track position with a pit stop under caution on Lap 234. He finished 14th. Pole winner Ben Rhodes led the first 23 laps on Saturday before rain and snow halted the race. 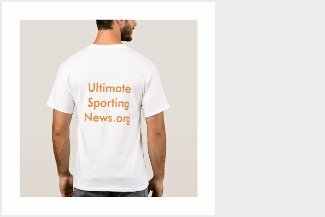 With heavy snow falling Saturday night and early Sunday morning, NASCAR was forced to postpone the finish until Monday. Rhodes won both the first and second stages of the race, collecting two playoff points, but severe trouble with his right front tire on a Lap 145 pit stop after the second stage dropped him to 15th in the running order. Rhodes never recovered from the loss of track position and came home 12th. Johnny Sauter lost two laps changing a battery after losing power on Lap 224 and getting rear-ended by Matt Crafton. Sauter finished 19th but retained the series lead by 29 points over Grant Enfinger, who ran fourth on Monday. Brett Moffitt, who pitted late for new tires, fought his way up to third at the finish and is third in points, 31 behind Sauter. Noah Gragson, Myatt Snider, Timothy Peters, Harrison Burton, Austin Hill and Justin Haley completed the top 10 in Monday’s race.